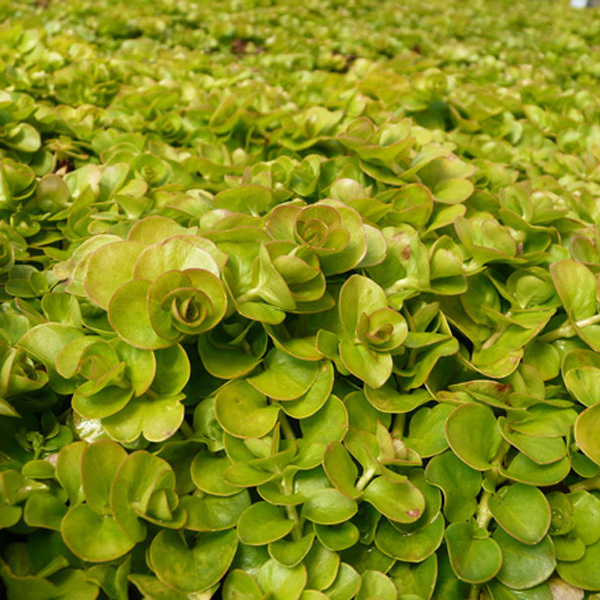 Golden Creeping Jenny is much more restrained in habit than the more common green type. Plants form a low mat of butter-yellow leaves, bearing bright golden-yellow flowers from late spring into the summer. Excellent in pots and tubs, or cascading over walls. Outstanding when used as a foliage accent. Consider combining this with any of the bronze or purple leaved Coral Bells. Since the stems root into the ground wherever they touch, this plant is easily increased by simply moving new plantlets in spring or fall. Semi-evergreen in mild winter regions.